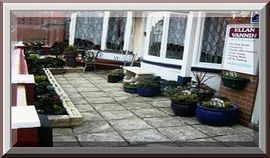 The Ellan Vannin in Blackpool is one of the nicer smaller accommodation providers with a 3 star accreditation. We have a friendly happy relaxed atmosphere and comfortable surroundings where you can relax and have a chat with other guests . You will be made to feel welcome even if you come on your own. 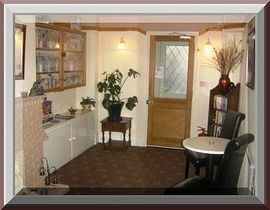 We can offer good friendly hospitality and enjoying Blackpool at it's best. 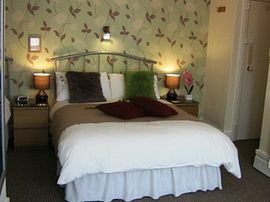 We are offering comfortable attractive accommodation in all the seven well appointed double and twin bed rooms. 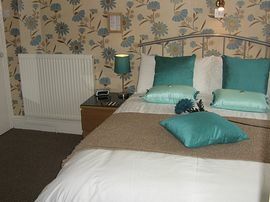 All bed rooms have had a new en-suite fitted, provided with freshly laundered towels and full double glazing. All rooms are tastefully decorated with Lcd TV's, hospitality trays, hair dryers, alarm clocks, ironing board's and complimentary toiletries. There are fridge cooler's if you are insulin dependent or just need a cool drink. The light and airy dining room is the perfect place to enjoy our excellent home cooked food and after you can sit and chat over coffee in the bar or outside in the garden. There is always our famous fresh full English breakfast to start the day. We are in a much sought after area due to our excellent location in the select Northshore just off the Promenade. We are close to the Hilton hotel Blackpool, Imperial hotel, Savoy Hotel Blackpool and Gardens, With Spectacular Cliff Walks. The Promenade and tram stop is only one minute walk from us, sorry no pets. 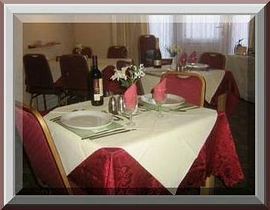 Prices from: £21.00 per person per night. Look at offers on our website. Closed from December to March. Country: BERKSHIRS IP Address: 234.253.30 .92 Date: 17 Apr 2009 16:23:22 GMT Comment: We have had one of our best times in Blackpool with Lorna & Pete. It is so clean it puts a lot of other guest houses to shame. The breakfast is out of this world and one of the best pints you will ever taste. We will see you again in September. As you can see the refit is top class, We recommend you give Lorna & Pete a try. A big thank you love sue Country: UK IP Address: 62.234.523.30 Date: 16 Mar 2009 20:22:28 GMT Comment: One of the best guest houses that we have stayed at. We will be back this year. We can confirm it is one of the cleanest places we have stayed at. A big thank you Lorna & Pete. Love Jim & Carol Country: SOUTH OF ENGLAND IP Address: 86.15.168.43 Date: 18 Jan 2009 21:21:48 GMT Comment: Can honestly say best hotel in Blackpool nice people and very clean and tidy! first class will go again with out a doubt. If your looking for a nice hotel with lovely company then this is your Hotel forget the unfriendly big hotels where your just a door number, This hotel your treated like a person. From the M55 head to the sea front then go a long the promenade with the sea on your left hand side. Pass the tower on your right and then on the left, you will see the North pier head and the Hilton hotel on the right. At the Hilton turn right and then 2nd left and you will find us on the left hand side. Or enter your address in the box below and get directions.